The tradition of sharing ghost stories at Christmastime is an old one, and with its long, cold, dark nights, it's the perfect time of year to indulge in all things spooky. The Diabolique Magazine team have put together a list of our favourite films to watch at this time of year. Our wintry picks include Edward Scissorhands, 12 Monkeys, Black Xmas, Horror Express, Gremlins and many more. 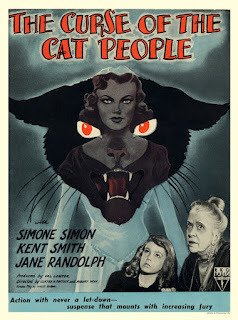 One of my own personal favourites is The Curse of the Cat People, a chillingly beautiful sequel to Jacques Tourneur's moody classic, Cat People. Under the guiding hand of producer Val Lewton and directors Gunther von Fritsch and Robert Wise, The Curse of the Cat People unfolds as an understated, oddly touching psychological study of the mind of a lonely young girl, with myriad scenes unfolding amidst an eerie winter wonderland. Head over to Diabolique Magazine’swebsite to read more… And wherever you are in the world, have a very Merry Christmas. Behind the Couch Turns 8 Years Old! Behind the Couch turned 8 years old this month! This year I have dedicated most of my time to researching and writing a book on The Company of Wolves for Devil’s Advocates, a series devoted to exploring the classics of horror cinema. Co-written by Irish filmmaker Neil Jordan and British novelist Angela Carter, and based on several short stories from Carter's collection The Bloody Chamber, The Company of Wolves is a darkly Gothic, boldly feminist reinvention of the fairy tale of Little Red Riding Hood. 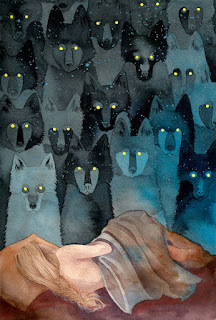 With werewolves. Released in the early 1980s, a time which produced several classic werewolf films (including An American Werewolf in London and The Howling), The Company of Wolves sets itself apart from the pack with its overtly literary roots, feminist stance, and art-house leanings. 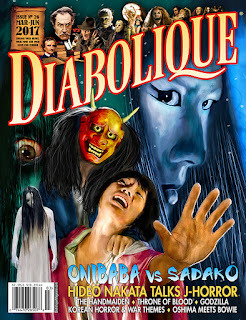 Diabolique is a bimonthly magazine covering every aspect of the horror genre, including film, literature, theatre, art, music, history and culture. Lavishly illustrated in full colour, each issue is packed with entertaining and thought-provoking articles. After a brief hiatus, Diabolique is now back in print and better than ever. At the helm is a new team of editors (Kat Ellinger, Samm Deighan, Heather Drain and Rebecca Booth) whose knowledge of horror cinema is surpassed only by their passion for it; not to mention their dedication to resurrecting Diabolique in print form and building on its legacy of thoughtful, insightful and compelling content.